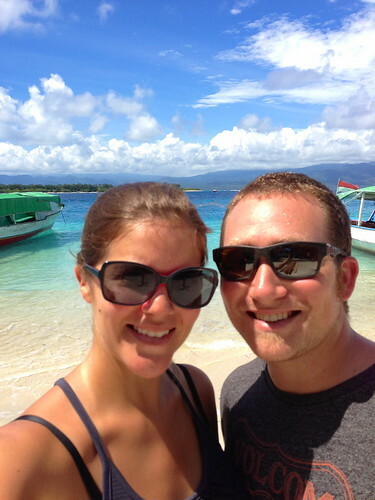 After we explored Kuta and Jimbaran (see part 1) we hopped on a $5 bus that took us an hour and a half north to Ubud. Ubud is where I officially fell in love with Bali. So, to keep you in suspense I’m waiting until Part 3 to talk all about this heaven on Earth. 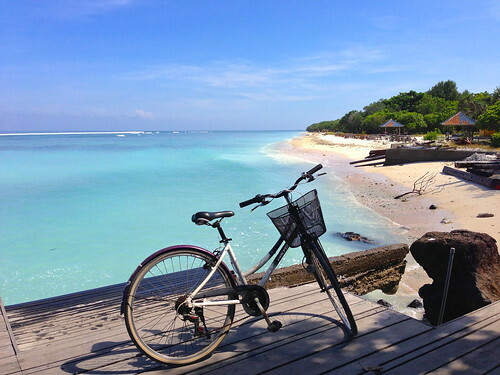 Part 2 I take you on our journey to Gili Trawangan, one of three small islands off the coast of Lombok (Bali’s neighbor island). We basically knew nothing about Gili Trawangan other than it is one of the places that the bus company we took (and every other bus company for that matter) advertised as a major destination. 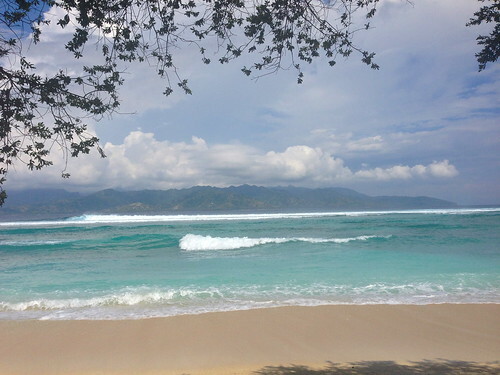 We also started to hear from people around us the first few days in Bali that it is THE place to go diving. Greg has been wanting to learn to dive, and snorkeling with the whale sharks in the Philippines sealed the deal that he would definitely be doing it as soon as possible. So we went! 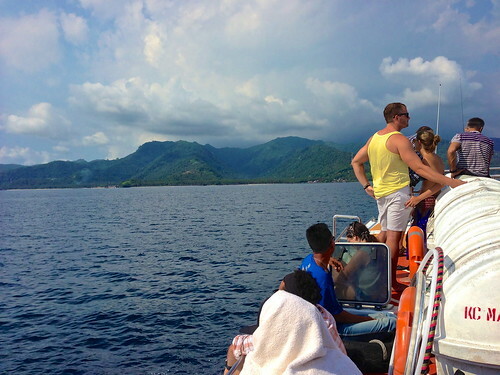 From Ubud, we hopped on a bus to the port and sat on top of a boat with the luggage to Gili Trawangan. At first I wasn’t so happy about having to sit on top of a pile of backpacks, but then I looked up and saw the blue sea and sky and was like, ok this is cool! Driving (boating?) up to the island, we knew we made the right decision to come here! 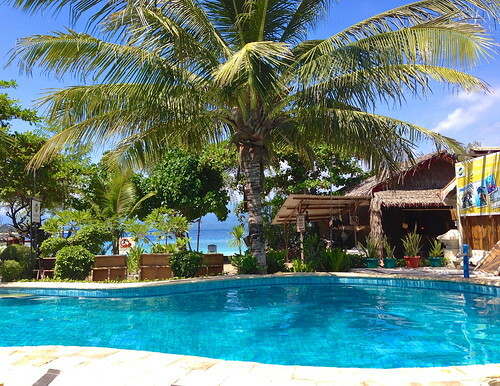 We found our hotel which also happened to be Greg’s dive school, Big Bubble Dive and Bungalows. Threw our bags down and went on a mission for food. 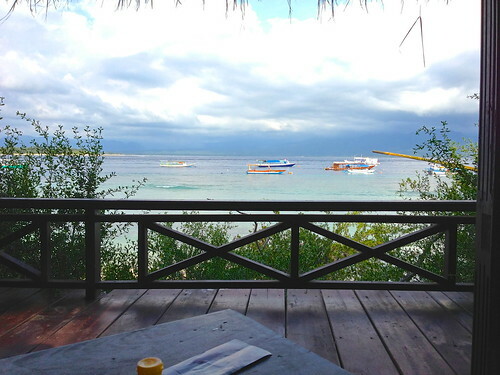 We didn’t go far because the restaurant right next door to our hotel had this awesome view (we later found that every restaurant has this view) so we sat down and enjoyed our first night on Gili T. That’s what the cool people call it. Greg got started on his 3 full days of diving school bright and early the next morning. This gave me a lot of alone time. My first alone time since we had started this trip. That was a little intimidating at first. We just arrived in a new place and I was basically going to be all on my own for 3 days. Everyone on the island is either diving or on their honeymoon. And since I’m neither a diver or a honeymoon crasher, I had to find a new friend. Her name was Sally and we spent a lot of time getting to know each other over those 3 days. Incase you’re confused, Sally is the bike. Not an actual person. Don’t look at me like that! 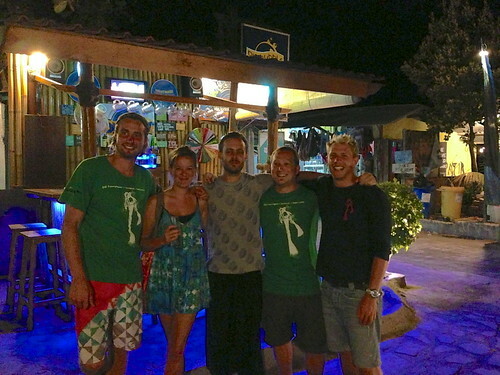 When Greg graduated and got his PADI Scuba Certification it was time for the crew to party! 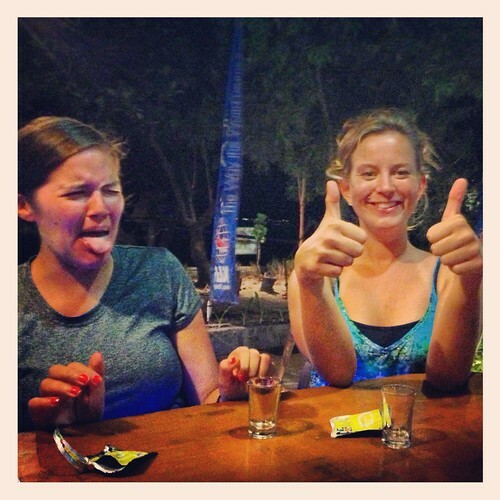 Basically the worst thing that happened on the island was the vodka joss shot and it wasn’t that bad (yes it was). 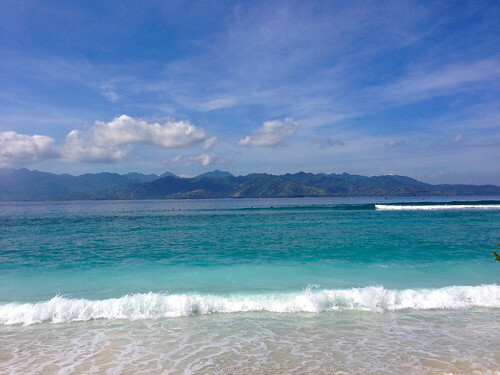 It was sad to say goodbye to this beautiful island, but we were going back to Ubud so I hugged Sally and the beach goodbye and hopped back on the boat. AMAZING!!! Your photos are gorgeous. I seriously want to go there!! Miss you guys. Super writing and great pictures!! Miss you both lots!! 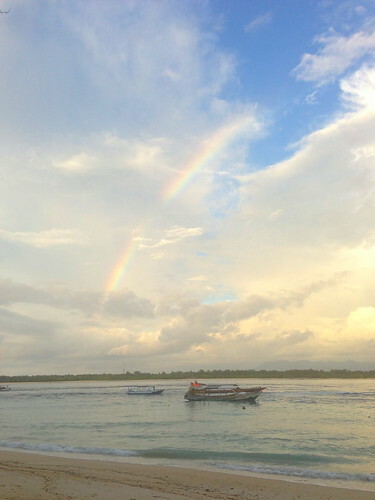 I adore Gili Trawangan! 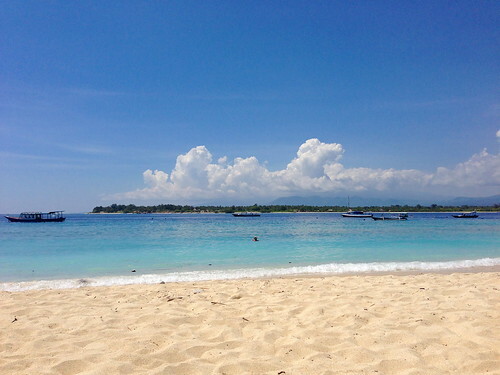 I have to admit Bali didn’t really do it for us, and someone recommended we go to GIli T., which totally turned our trip around. We spend an afternoon just strolling around the circumference of the island – it was so magical. 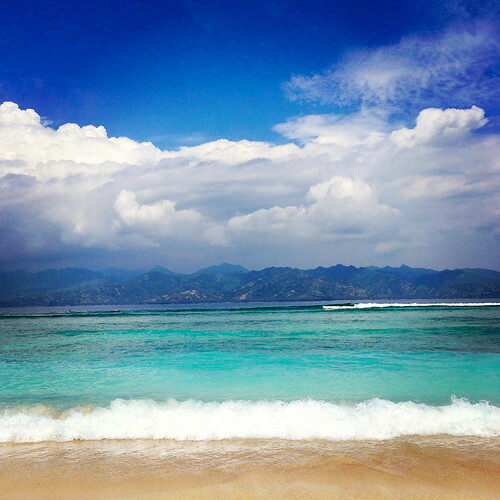 My boyfriend and I went to Bali last year around this time and it certainly was a holiday to remember! Such a beautiful place with amazing people. Looking forward to reading more about your adventures! 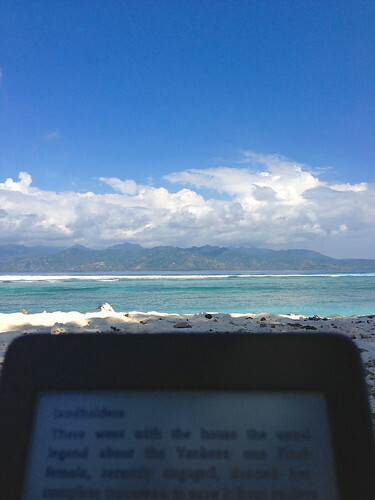 It really is best part about Gili T. I’ve never been on an island I could easily walk around completely. And being surrounded by beautiful blue water wasn’t so bad either! ugh, I cringe every time I think of that vodka joss shot. Bleh! I think it’s so, so cool that Greg got to the diving school in such an incredible place. And three days of solid alone time and beach sitting? I think I could handle that.